'When we say “the world has ended,” it’s usually a lie, because the planet is just fine. Of all the Geeky Baju I've drawn over the past months, this is the one I'm most excited about. What is there to say that hasn't already been said by critics and fans? Compelling, powerful, ground-breaking... every book in N. K. Jemisin's The Broken Earth trilogy won the Hugo Award, an unprecedented achievement that's well-deserved. I don't want to say too many things because I went in with no knowledge or expectations of the story, and was completely blown away. It upended everything I've come to expect about speculative fiction. The narrative moves between first, second, and third person perspective. Geology and the power to shape the earth take center stage. But with power comes fear, and at its core the trilogy is about who possesses power in the massive continent of the Stillness, and how society simultaneously uses and enslaves those it marginalizes. This set is centered around the characters introduced in the first book, The Fifth Season. Look elegant and ageless in a silk pleated sari. A sari is worn with a bodice and petticoat, wrapped so that the same length of cloth forms both a skirt and a shoulder or head covering. For the statuesque, unnerving stone-eater Antimony, we have a sari made from heavy silk, draping as if the wearer were made from smooth porcelain. There are countless ways to tie and drape saris, and all manner of materials to make them from. Sometimes a simple statement speaks the loudest. Reach out, reach in, rend the fabric of the earth while donning a patterned kurta. Kurtas can be worn as formal or everyday dress, with side slits providing ease of movement. Mentor, madman, catalyst: Alabaster Tenring is an extraordinarily powerful orogene (a race with the ability to harness the power of the Earth through their sessapinae). In the world of the Stillness, orogenes are feared and typically killed when young, except those taken to the Fulcrum and put into service. Alabaster has seen enough, seen too much. The embroidery rising from the hem to the collar of the kurta evokes the eruption of a volcano. Gather power and stand your ground in a jacket inspired by the Akha and Hmong of Laos. The jackets are made from black cotton decorated with coloured stripes in applique. For Syenite, I wanted something which would be both comfortable and hardy, at home on the road or in the Fulcrum. Both Alabaster and Syenite's designs are predominantly black, the assigned colour for Imperial Orogenes, with blue hinting at the frost that results when they perform orogeny. This is particularly visible as embroidery on the wrap skirt. Note also the seismograph-inspired sewing on the cuffs. I looked to the Akha and Hmong for inspiration. Their indigo-dyed cotton jackets are often decorated with coloured cloth in applique, along with needlework. 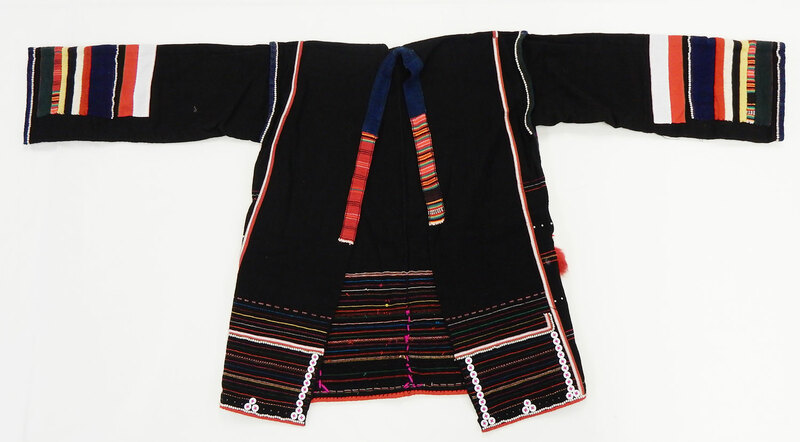 Akha women's jacket from the collection of the National Museums Scotland; image from this post. During my time in Laos, I visited the excellent Traditional Arts and Ethnology Centre (TAEC) in Luang Prabang to look at textiles; I recommend donating to them if you can so that they can continue with their research, education, and advocacy work! One of the exhibits at the TAEC; photo from Culture360. Maintain the balance with a warrior's baju, samping, and keris. Ways to wear the keris differ according to region, with some tucking it into the samping at the back and others in the front. Imposing, deceptively gentle, and ruthless, Schaffa is introduced early on in the tale as a Guardian, tasked with ensuring order and compliance among the orogenes. It seemed natural to design something based off Nusantara/ Malay warrior garb, along with a keris tucked in the front of the samping. Gold trim and embroidery along the pocket and shoulders lend an air of authority to the outfit, though he hardly needs it. All of the characters' designs have some red in them, but Schaffa's is fully red and burgundy, the colour of the Guardians' uniforms. Here's an oil painting by the Malaysian artist Hoessein Enas, depicting a young warrior with headdress. So - have you read the books? (I hope you will, if you haven't!) What do you think?